This is a product-provided, sponsored conversation that contains affiliate links. I received a 36-count carton of CharcoCaps® Anti-Gas Dietary Supplement Formula for my own personal use. All opinions, text and experiences are my own. If you’re following me on Instragram, you’ve probably noticed that I’m making an effort to be more health conscious in the foods that I’m preparing. Now, don’t get me wrong, I haven’t stopped all together. You’ll still be seeing decadent dessert recipes as well as some brand new cupcake recipes. They’ll just be in moderation. I’m making healthier choices especially when it comes to my main dishes, while continuing my love of the grill. Yep, the grill. 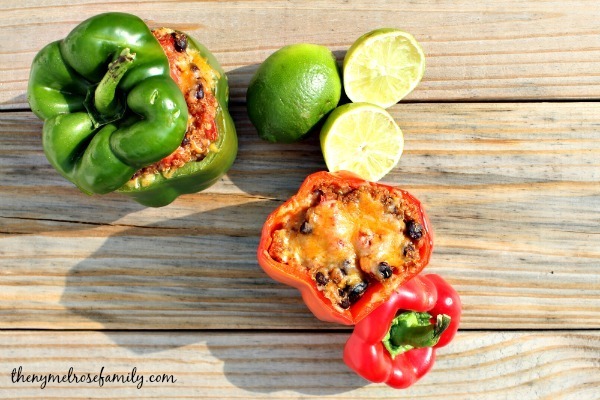 These Quinoa Stuffed Peppers are the perfect side or main dish for grilling! We are still in Summer mode here in NY because we don’t head back to school until the first week in September so I’m taking advantage of my husband’s grilling skills as long as possible. 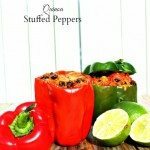 We made these Quinoa Stuffed Peppers just the other night and they served as my main dish and my husband’s side to go along with his BBQ Bacon Chicken Kabobs, which I might have snuck a bite or two of. Can you blame me?! They’re made with BACON! 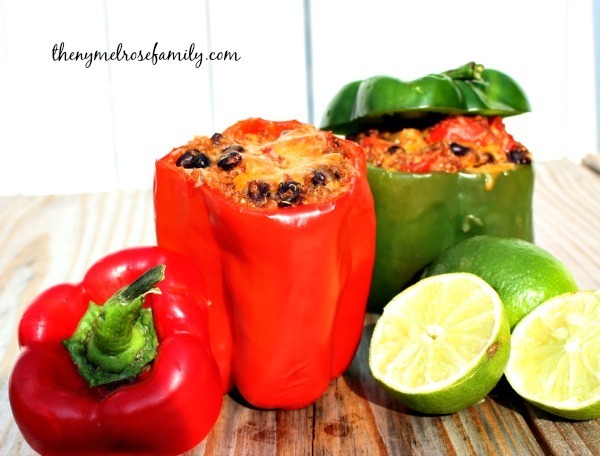 These stuffed peppers work well on the grill, but would work just as well in the oven. We just didn’t want to warm the house up so it was easy enough to throw a little tinfoil underneath each pepper and set them up to get a nice fire roasted char to them. Since I’ve started eating healthier, which has meant more veggies and more gluten free snack options, I’ve also found that it makes me a bit gassier, which is not a fun experience. 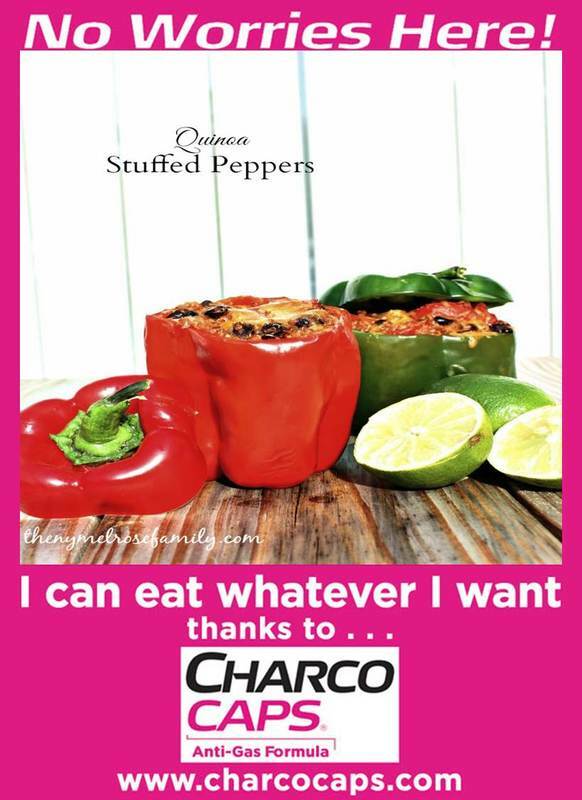 Luckily, CharcoCaps® gives me the ability to eat these healthier foods without the fear of gas and bloating. CharcoCaps® ​is a unique, safe, dietary supplement that naturally absorbs and eliminates intestinal gas and bloating. CharcoCaps® ​are gluten, sugar and dairy free and can be found at major retailers like Walmart, CVS and Walgreens. My favorite part is that there’s a giveaway going on right now for all of you. 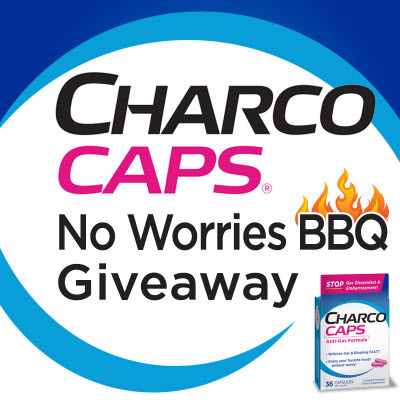 Head on over to CharcoCaps® Facebook Page for your chance to win a new outdoor grill, grilling accessories and a 36 count carton of CharcoCaps® . The giveaway runs from July 24th to August 21st. Now that I’ve shared my biggest culprits of gas and bloating what would you eat if you knew you didn’t have to worry? I’d love to hear or even see your favorite food that you’ve been avoiding. Leave me a comment or link letting me see what it is! For all the latest information on CharcoCaps®, LIKE us on Facebook: www.Facebook.com/CharcoCaps visit www.charcocaps.com. This is a product-provided, sponsored conversation that contains affiliate links. I received a 36-count carton of CharcoCaps® Anti-Gas Formula dietary supplement. All opinions, text and experiences are my own. 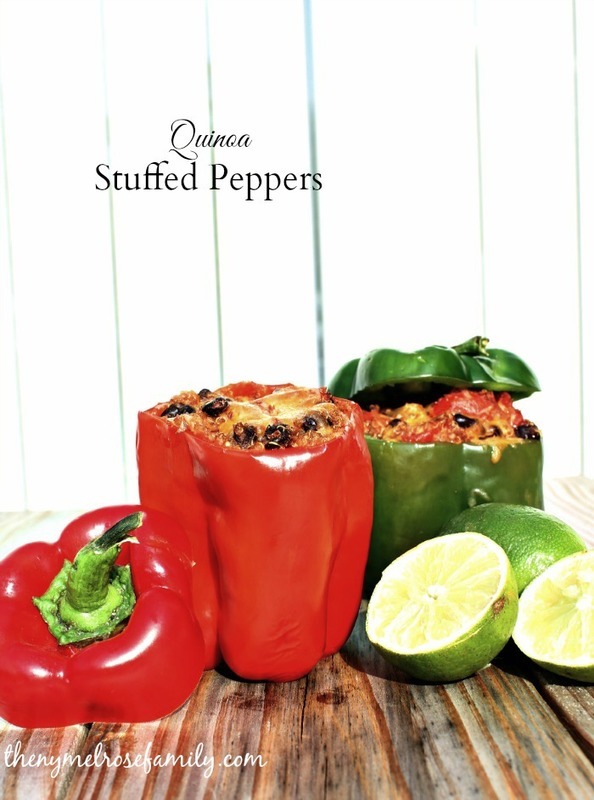 Quinoa Stuffed Peppers are the perfect protein packed main dish. Prepare the cup of dried Quinoa according to the package directions. Start the grill or oven to preheat at 375 F.
Chop the tops off of the bell peppers and clean out the membranes and seeds. Set aside. Once the quinoa is cooked combine it with the tomato, tomatillo pepper, garlic, black beans, chili powder, cumin, coriander and salt. Stuff each of the peppers with the mixture and finish with a squeeze of lime over the top of the quinoa once it is in the pepper. If you're grilling the peppers, set them on top of tinfoil to keep them in place and grill for 30 minutes. If you're baking the peppers, set them inside of a baking dish and bake for 25 minutes at 375. Five minutes before the peppers are done sprinkle the tops of them with Taco blend cheese and continue to grill or bake. This looks amazing! Making these for dinner this week! Pinned! Sounds yummy! I am definitely making these!